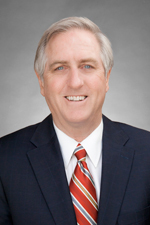 Jim Keeling maintains a business law practice with emphasis on organizational and transactional matters including mergers and acquisitions and real estate. He also advises numerous individual and business clients in the areas of estate and financial planning and real estate development. In conjunction with both his business law and estate planning practices, Mr. Keeling also advises closely held businesses and family businesses on ownership relations and succession planning issues. Mr. Keeling recently served as Practice Group Leader of the national Commercial Transactions Practice Group of Hinshaw & Culbertson LLP. He has also served as partner-in-charge of the firm’s Rockford office and as Chairman of the Board for Hinshaw Consulting, LLC a wholly owned subsidiary of the firm (2012-2016). Mr. Keeling has been certified by the United States District Court, Northern District of Illinois, Western Division, as a court annexed mediator. Health Care Reform – Are You Ready?